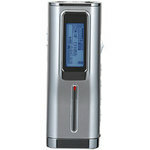 Office Zone is proud to announce the addition of new digital voice recorders that capture sound with pure digital quality that can later be used for taking notes or transferring to a computer. These new recording devices are compact and easy to use. Office Zone announced today that they have added three digital voice recorders to their Web site that are used to capture sound, speeches, conversations and even phone calls. These voice recorders are the digital equivalent for sound as digital cameras are for photographs. Some digital recorders can record up to 65 hours of digital sound that can be uploaded to a computer for later note taking or editing. Digital voice recorders are growing in popularity among lawyers, students, doctors and professors for recording interviews, speeches and more for later dictation. Digital recordings hold their quality and last far longer than traditional “tape” recordings. Audio transferred to computers can be burned to CDs and hard drives for long-term storage. The sound quality with digital recorders is far better than traditional analog tapes. Digital recorders have several uses. News reporters will use digital recorders for news conferences and interviews. A voice recorder can be a lifesaver when trying to gather as much information as possible for a story or news article. Students like to use digital voice recorders for recording professors and later study. Students especially like to record data during class, allowing them to participate more in class activities and frees up time from note taking. Recorded classes and discourses can be later transferred to notes or be used for group study. Digital voice recorders are much more compact than traditional tape recorders. They can easily fit in a purse, a pocket or other locations for easy transportation and recording. A phone attachment allows phone conversations to be easily recorded. Digital recorders can even be used to record telephone conversations, used for preserving memories or for investigational work. You can see Office Zone’s entire line of digital voice recorders by going here: http://www.officezone.com/digrecord.htm. For further information, please contact Morgan Cloward, Marketing Director of Office Zone, 1-800-543-5454.